Product Groups are categories that organize your inventory for convenient access in ordering and reporting. All the individual products you carry must fit into one of the groups you create. 1. On the Assigned tab that comes up, click on the name of the Group you want to edit. 1. If you rename the product group, all products in that group will be automatically transferred to the new name. 2. Product Categories are the standard pre-selected designations like Hair Care, Skin Care, Makeup, etc. Moving a group from one of these standard categories into a different one will not change the name of the group or the products within it. 3. After changing a product group or category, you may also want to reassign a new Sort Order and readjust the Sort Order of the other groups so your most used groups remain first, second, third, etc. on your schedule and in reports. 4. To transfer products between groups, see Add/Edit a Product in the KnowledgeBase. 1. Click the Available tab. Click on the green circle icon next to the group you want to use. It will be transferred to the Assigned list. 2. 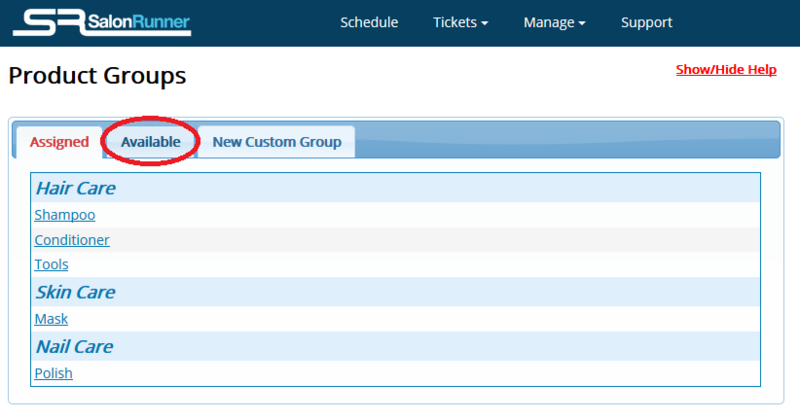 Click the Assigned tab, then click the name of the new group and fill in the fields on the screen that appears. 3. Product Group Name is the name that will appear on schedules, reports, etc. Choose a name that is meaningful to your business or in the case of something simple like shampoo, even a generic name such as the one shown in Product Category. 5. 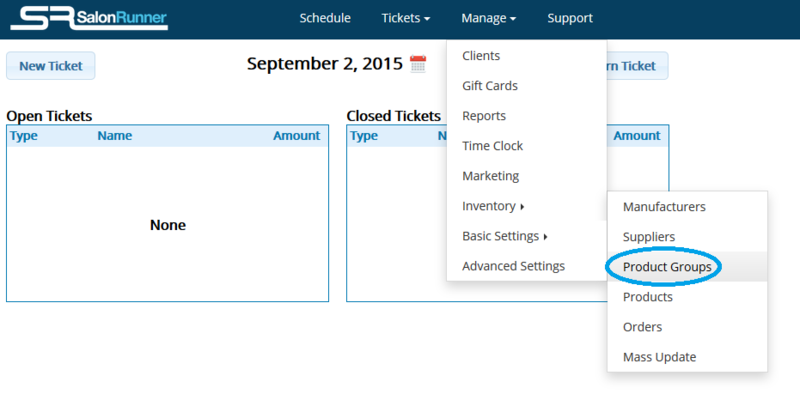 Sort Order determines in what order the groups will appear when scheduling an appointment or in reports. You may have to readjust the Sort Order of the other groups so your most used groups remain first, second, etc. on your schedule and in reports. 7. To transfer products from another group into your new group, follow Steps 1* through 4* of the instructions below under “Delete.” To add new products into your new group, see Add/Edit a Product in the KnowledgeBase. If your business has a group of products not covered by the list of standard groups, you can create a group. You cannot delete a Product Group without first transferring all its products to another group. Inactivating a product does not remove it from the group. To clear all the products from a group in order to delete the group, you may inactivate the ones that are discontinued but they must still be removed to another group. Transfer products from one group to another through the individual product records; or if the group contains more than a few products, the easiest way to do this is through the Mass Update. 2. *In the Filter box, select the Product Group name that you want to delete (or transfer products out of) and click Go. You’ll get a list of all products within that group. 3. *Select the name of the new group from the drop-down box for each product. 5. When all products are removed from the Product Group you want to delete, go back to the Product Group listing and click the Assigned tab. 6. Click the name of the group you want to cancel and then click the Delete button on the screen that comes up.